"He who has travelled alone can tell what he likes"
Drinks. Dinner. Views. The Trifecta. Important Information about this Experience. What to Bring on this Experience. Okay, so you still need to try Rwandan brochettes? Or double down on that giant fish? How about we pair that up with a great sunset view? Oh, and you'd like a cocktail too? Sure thing! Repub Lounge (formally Republika) offers a more upscale dining experience with delicious food, a great bar, and marvelous views. After dinner, stay and enjoy the beautiful views over Kigali with a cold drink and a couple of friends. Hey, you are in Kimuhurira after all, the bar/lounge scene neighborhood! A perfect way to end a pretty jammed packed day if you ask me! PS. Definitely make a reservation and absolutely request the patio! It's worth the wait. PPS. If you happen to be around on a Friday, don't even think twice about missing out on their local jazz night from 8:00 - 10:00pm! I know, I know, walking around the Convention Center in Kigali doesn’t sound like a fun activity, but the Convention Center here is more than just a pretty building, It stands to represent a promise for the future (plus it has a couple rewards to show off as well). Also, there is a great gelato spot next door so head over to Delizia Italiana and grab a cup (or in my case a cone) of creamy Italian gelato and let's take a stroll around the circle! The shape was inspired by the King’s bee hive-shaped residence, with the spiral motif representing the classic Rwandan baskets. 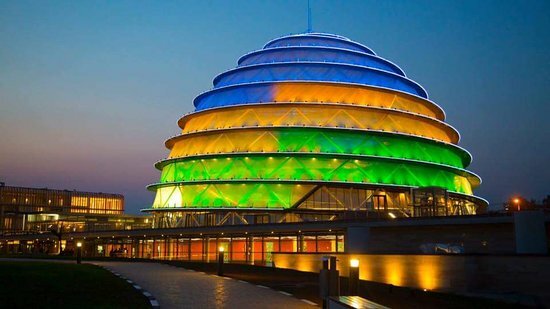 Keeping In line with Rwanda’s focus on sustainability, the convention center serves as a role model for sustainable development, with a special coating on the windows to regulate temperature, and the use of “gray water” for irrigation. Finally, the convention center’s dome was purposefully made transparent to represent openness enforcing the idea that everyone should be able to enjoy this building, not just the elite. How's that for a convention center?! Get your caffeine fix and support a good cause? Sign me up! With a focus on supporting local, women farmers, Question Coffee in Kigali offers more than just a delicious cup of jo (PS. they even serve delicious pastries from our favorite, Baso Patissier). As part of the Relationship Coffee Institute, Question Coffee reinvests its proceeds back into their coffee communities by providing education and business training to produce better coffee while also helping the members of the community become successful business people. Good coffee and good people. No Questions about it. I don’t know about you, but I’m always hungry after a day of shopping (okay yeah I’m pretty much always hungry but even more so after shopping!). Luckily, when you leave Kimironko Market, you won't have a problem finding a taxi or calling a SafeMotos to take you back into town. Just make sure to let them know you are heading to The Hut! Sometimes you just need a good portion of comfort food, and The Hut, will not disappoint. And for those vegetarians out there, check out the “Not a Boring Veggie Burger.” Bonus points: if you happen to be there on a sunny day, for 4,000 RWF (around $5 USD) you can enjoy the pool at the boutique hotel with an excellent view, which also goes well with the extensive cocktail menu. Do you like Piña Coladas? Now that you are well rested and have satisfied your appetite, hop on a SafeMoto (or you can take a regular old taxi) and cruise over to Kimironko Market. Remember everything we said about Rwanda being clean, tranquil, and pretty easy to navigate? Well, you can throw that all out when you visit Kimironko. 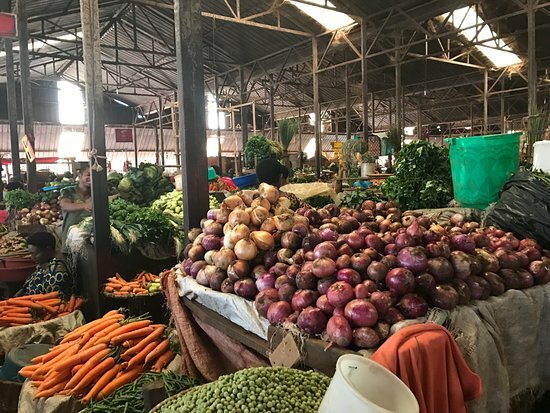 One of the busiest markets in Rwanda, this is where the city truly comes to life. If you still need to pick up those souvenirs (why not check out a traditional agaseke basket) or just want to get a taste of what an east African market is like, you can’t miss out on this experience. There are four entrances, and while it may seem overwhelming, it gets a little easier to navigate once you get the lay of the land. Everything is organized by category, similar to a department store. Be prepared to negotiate prices and as always use common sense when in a crowded place and stay mindful of your personal belongings. Open seven days a week from 8:00am- 7:00pm, Saturday and Monday mornings are said to be the busiest and Sundays a little slower. And also, get ready to be overwhelmed, but don’t forget to soak in every last detail! While it may not be in the neighborhood, we couldn't finish a guide in Kigali without ending the night on the patio at Choma'D. Keeping in line with the theme of beautiful views, Choma'd offers delicious cocktails, cold brews, and if you are still craving a little something, some good o'l comfort food as well. Come for the views, stay for the cocktails. Want a traditional Rwandan dish? And a quaint atmosphere? Then you have to head over to Chez John for dinner. I should add, most guides will send you to Panorama Ten to Two or Green Corner and yes, they are definitely the more traditional "big fish" eateries; however, we really loved this neighborhood spot, and didn't see a single tourist in sight. Plus, everything on the menu is delicious so if you don't eat seafood, don't worry! Now what exactly is a Big Fish you ask? 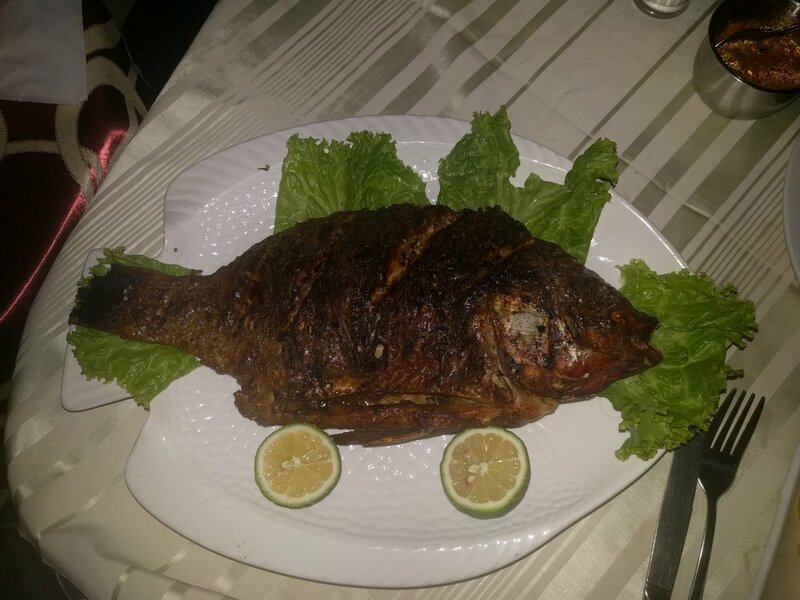 Well it is pretty much exactly that: a giant whole grilled tilapia served with onions, spices, and lemon. This is definitely a sharing fish, it can feed up to three but lets face it, I usually eat for two. And if you find room in your second stomach, you can try traditional Brochettes, grilled meat (or fish) on a stick and probably the most popular (and consumed) dish in Rwanda. Wash it all down with a large, cold Primus...or four. Yes, I should warn you, you can wait up to two hours for your fish so make sure you have time and don’t show up starving. You can also try to call ahead and order your fish in advance. Enjoy! 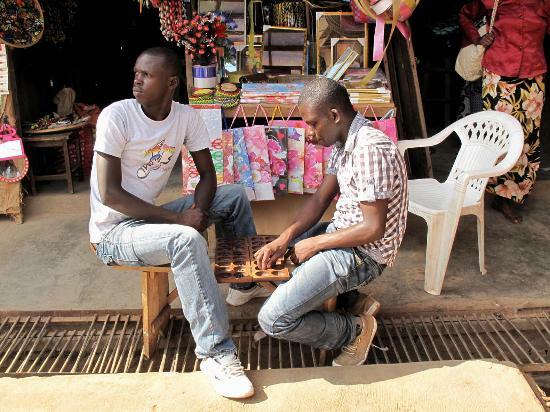 Nyamirambo, one of Kigali’s oldest and most vibrant neighborhoods has the highest number of muslim residents, and happens to be THE spot for Kigali's nightlife. While Nyamirambo can be quite intimidating at first, this is a chance to explore a real neighborhood and also take part in a great social initiative with the Nyamirambo Women’s Center. The NWC was started by 18 Rwandese women in 2007, living in Nyamirambo who together created an initiative aimed at addressing gender based violence, inequality, and discrimination while providing education and training to underprivileged women. Don’t miss out on this 2.5 hour tour, and if you didn’t eat that burger at Baso, make sure to include lunch with your tour. Let’s just say it’s as traditional as they come! PS. There will be plenty of souvenir shopping opportunities so don’t forget your shopping bags! Coffee. Sweets. And a Cheeseburger? Sign Me Up! With French as one of the main languages in Rwanda, its no wonder that finding french influenced baked goods isn’t hard to come by in Kigali. And if you are in need of that coffee break and want to satisfy your sweet tooth, don’t miss out on Chef Bruno Basomingera's idyllic shop, Baso Patissier. Born in Belgium, Chef Basominger's Rwandan roots come from his father, and at the young age of 12, he knew exactly what he wanted to do in life when he enrolled in a top culinary school. Today, you can enjoy the mouth watering mix of French and Belgium pastries in the heart of Kigali. Especially that eclair! And Bonus points, they serve Question Coffee (link to day 2). PS. They also have a killer burger! Rwanda’s history is undeniably tragic, but the efforts this country has made to emerge into the success story it is today has been remarkable. And you are first reminded of this from the second you step off the plane at Kigali International where you are welcomed with a sign warning visitors that plastic bags will be confiscated. Its no wonder that It’s one of the most beautiful and cleanest cities in Africa. The Genocide Memorial in Kigali, where an estimated 250,000 Rwandans are buried, opened ten years after the horrific events that took place in 1994. It serves as a place for family members and friends to mourn the lives of loved ones lost. It's a place for those who lost their brothers and sisters, grand-parents and friends, uncles and aunts, and mothers and fathers. It's filled with sadness and anger paralleled and yet surrounded by beautiful gardens and landscape offering a sense of tranquility. It will be an emotional visit to say the least but one that can't be missed. Admissions are free but you are welcome to leave a donation. We opted to purchase the Audio Guide as well for 12,000 RWF ($15). Photography is strictly prohibited inside the memorial but you are free to take pictures outside if you'd like. We don’t usually include hotel recommendations but given how much we loved Heaven Boutique Hotel in Rwanda and it’s perfect location, we figured why not. Do yourself a favor and stay here! Heaven sits above the city in the Presidential neighborhood, just steps from downtown Kigali (we walked almost everywhere), and because of its unique location, you have a beautiful view of the city. It also has one of the best restaurants in town if you feel like dining out in style! Whether or not your room rate includes the delicious breakfast buffet, it is one we feel is worth a visit. And while it may be a hotel buffet, don't feel like you are missing out on things to do in Kigali, as it is often found on all the “best breakfast in Kigali,"lists. If you still feel the need to leave the hotel grounds and get a little exercise, you can head over to the historical Hotel des Milles Collines right around the corner and enjoy the breakfast buffet (and potentially take a dip in the pool) at La Terrace.